Mad Men has quickly become a favourite television show of mine, and I loved the reference to Frank O’Hara in episode one of the second series. 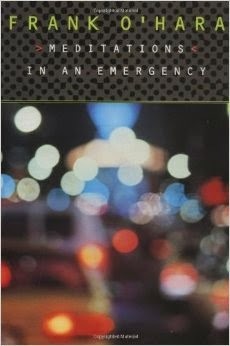 Don sees another man reading Meditations in an Emergency in a bar, and asks if it is any good. The man replies that Don “would not enjoy it”, which inevitably influences Don to read it for himself and find out. Don appears to see something of himself in the book, but he is also reminded of somebody else. He writes a dedication to this person in the book’s inlay pages, and walks to the postbox to send it. Meanwhile, we hear Don’s recital of the verses above (you can watch this scene here on Youtube). While the scene is so beautiful produced, I think this poem is a fitting choice for Mad Men for various reasons. There’s the obvious mention of modernity that reflects the nature of the show, but there’s also the connection between Don’s personal struggle and that of the poem’s speaker. Don is struggling with issues that regard family, love, and identity, and we can only wait for the inevitable culmination of his anxiety and anguish. In other words, for the “catastrophe of [his] personality”. Perhaps Don’s reading of this poem marks the peak of his troubles, and everything will soon be “beautiful again”, although I’m not convinced. I’m sure those of you who also watch Mad Men will have more insight. I’d like to memorise the first stanza of the passage that I have quoted above: I think it would help me during difficult moments, and reminds me of the proverb “this too shall pass”. The second stanza, in its description of laughter and beauty “always diminishing” is such an accurate depiction of depression, and I’m sure many can find familiarity in it. As for the final stanza, I’m sure we can all relate to the confusion of who we are and what we think. This is a reading very centred on bibliotherapy, but I think the inclusion of the poem in Mad Men has a similar purpose. Don, having felt confused and divided for some time, finds reassurance in a poem. After some research, I’ve found that O’Hara’s book reappears at various points throughout the second series. I’m looking forward to this, and I’ll be sure to post any other reflections I have. Why didn’t I start watching Mad Men before?! As always, do comment if you have anything to agree with, disagree with, or add. Mad Men appreciation will certainly be accepted in the comments box. Also, I always enjoy hearing about poems and books that have helped you through similar situations. If you liked this post, do check out Angeliki’s post “What do Mad Men read” over at Reading Psychology. If you’re anything like me, it’ll fill up your to-read list! 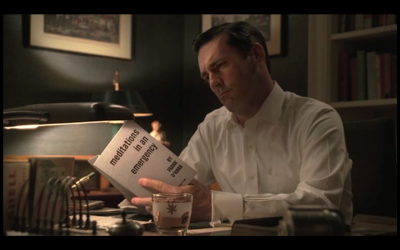 Don Draper reading Frank O’Hara’s Meditations in an Emergency. Unfortunately I have not been able to fit any television time into my schedule. There are several shows out there including this one that look like they are worth watching. It was literary connections to television shows that helped get me interested in reading in the first place. The literary connections are interesting. I had never read that poem before but pondering these lines and I really like them. Brian, thanks for your comment. That's interesting that literary connections got you into reading – I hope that with the plentiful references today it's happening to more people! And I certainly would recommend Mad Men to you. I'm now watching Season 6 and still loving it. Don is a real conundrum isn't he? That's a great poem. Hi, Annabel. Yes, my thoughts on Don seem to change every episode! He's certainly complex. I'm glad you enjoyed the poem. I always like it when I'm introduced to new poems by TV or film!